Wrangler filtered cigars have discontinued soft packs. But they are still available in box! 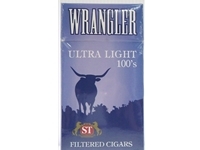 Wrangler Ultra Light Filtered Cigars come in 10 packs of 20 filtered cigars each.